Why don't you spend the night in the villa? Vila Veselova has Certificate of Excellence 2015 by Tripadvisor, FREE breakfast, FREE coffee/tea, FREE WI-FI & computers and FREE SMILE ;). It’s located in the diplomatic area of the city, just around the corner from a few embassies (Austrian, German, American, Russian and Japanese) and within a walking distance to the town centre, main sights and other points of interest in Ljubljana. City's main park is just a stone throw away from the property and offers abundance of green area and relaxing walks. This was my first time staying in a hostel and I was pleasantly surprised! The staff was extremely friendly and gave us really good tips on places to visit during our trip. Every person had a spacious drawer that locked under their bunk bed. Everything was clean during our stay. They also offered free breakfast which was fruit, cereal, and bread with various jams. Very basic, but filling! Everyone ate breakfast around one table so it was a good time to interact with other travelers. LOOOOVED this place so much. Beds are lovely, location is great and staff were so friendly and took care of me, even though I lost my room key after being in the hostel for 30mins while out for a run! Great location right near the biggest park in Ljubljana! Staff gave great local recommendations! You can't ask for more at this hostel. Everything is great. Incredible staff, super knowledgeable and helpful. Clean rooms. Lockers for each bed, no personal lock needed. It's a 20 minute walk to the main train/bus station, and from there you can get anywhere. Only a five minute walk to the city center. 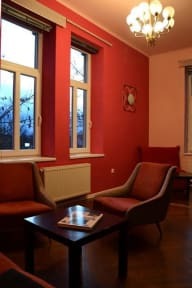 Small hostel, bringing a relaxed atmosphere. Easy to meet other travelers. Absolutely no complains! The lady at the reception was so helpful and gave me loads of information! This hostel is awesome and I would definitely come back! The free breakfast is decent, the staff are super friendly and helpful, and the overall atmosphere is just great here. The location is really nice with the tiny exception of being right next to the highway. My only complaint is the beds were a little hard/should be updated probably. P.S. there’s a (friendly) dog sometimes in the hostel! For me that was great but if you have an allergy maybe find somewhere else. It's a nice place with warm staff and, fortunately, with good residents. I will consider here for my next visit. Cozy place with full of good vibes, friendly staff (+ they are super helpful by recommending bunch of restaurants, cafe, bar sightseeing, trips, etc.) and spacious rooms and location. Really helpful staff. Basic yet nice breakfast. Toilet a bit dark and not super clean. Facilities a bit worn out but overall a nice stay.